The exact dates change each year but this year, Diwali 2018 falls on Sunday 27th October. 2) Diwali takes place annually and lasts for five days, marking the start of the Hindu New Year. The exact dates change each year and are determined by the position of the moon – but it usually falls between October and November. 3) The word Diwali (or Deepavali as it’s sometimes called) means “row of lights” in an Ancient language of India, called Sanskrit. 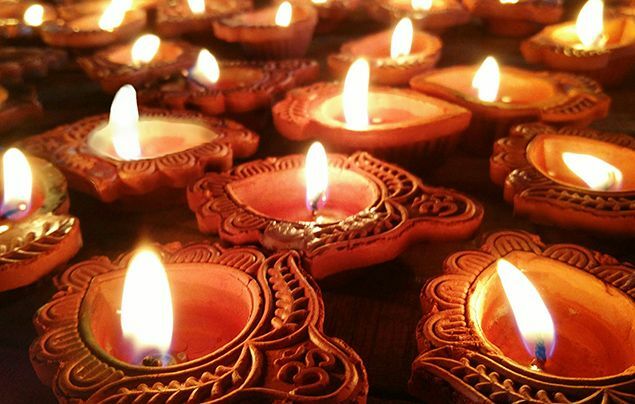 During this festival, people decorate their homes with lights and oil lamps, called diyas. 4) For many people, Diwali honours the Hindu goddess of wealth, Lakshmi. The lights and lamps are said to help Lakshmi find her way into peoples’ homes, bringing prosperity in the year to come! 5) It’s also a celebration of good triumphing over evil, and different legends based on this theme are associated with Diwali. In northern India, Hindus celebrate the return of the deities (gods) Rama and Sita to the city of Ayodhya, after defeating the evil king Ravana! 6) In the region of Bengal people worship the goddess Kali, the destroyer of evil forces, during Diwali. And in Nepal (a country bordering north-east India), people celebrate Lord Krishna’s victory over the wicked king Narakaasura. 7) But it’s not just about lights and legends –– Diwali is a time to have fun with friends and family! People exchange gifts and sweets, enjoy delicious feasts, watch firework displays and wear new clothes. It’s a time to clean and decorate your home, too. 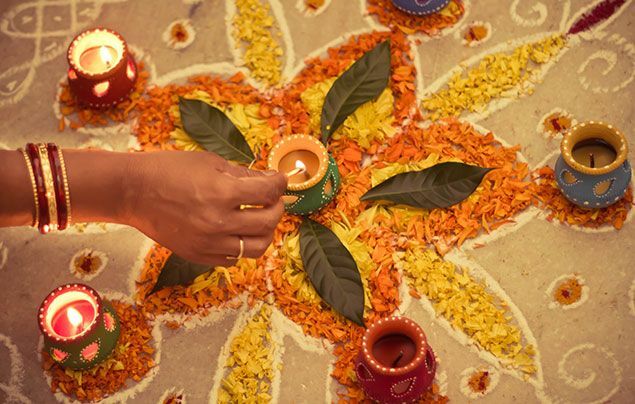 8) Rangoli is a popular Diwali tradition –– beautiful patterns made using colourful powders and flowers. People draw rangoli on the floor by the entrance of their homes to welcome the gods and bring good luck! 9) Today, this fascinating festival is celebrated by thousands of people in countries all around the world. 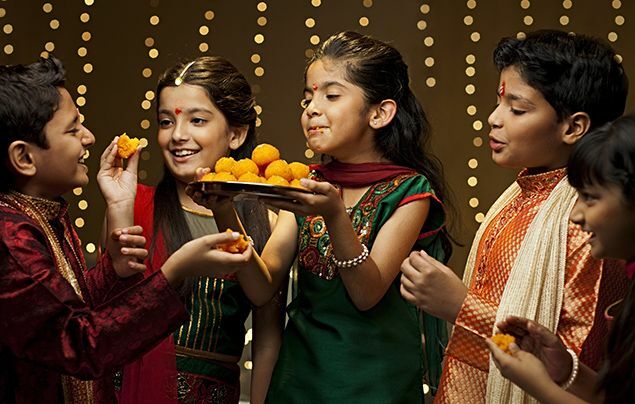 During Diwali, Hindus living outside India gather at places of worship called mandirs to leave offerings to deities, watch firework displays and eat yummy food together! 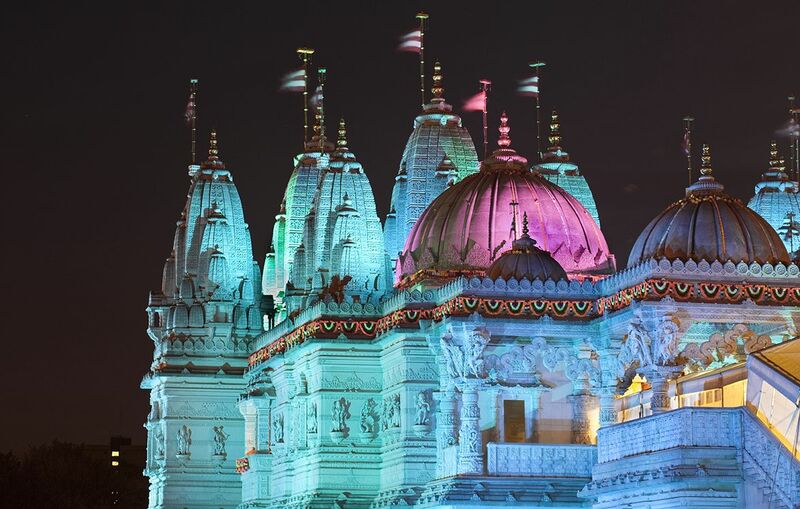 10) The city of Leicester, in the United Kingdom, holds the largest Diwali celebrations outside of India. Every year, tens of thousands of people gather in the streets to enjoy vibrant shows of light, music and dancing! *Hinduism, Sikhism and Jainism are three religions founded in India. What did you think about our facts about Diwali? Leave a comment below and let us know!